As a service to North Carolina voters, the NC Family Policy Council has surveyed all candidates running in the Special Election for U.S. House District 3 to replace Congressman Walter B. Jones, Jr. The candidates’ responses to our 2019 Candidate Questionnaire are included below. We invited candidates to provide additional comments or explanations for their responses, if the “Yes,” “No,” or “Undecided” response options did not allow them to fully express their positions on the issues. You may click on the candidates’ names to view a scanned copy of their questionnaire and additional comments. NC Family made multiple attempts to contact all candidates by mail, phone, and email (when available) to encourage their participation in NC Family’s non-partisan 2019 Voter Guide. You may download a copy of this voter guide here. If you are unsure in which congressional district you are registered to vote, check your voter registration card or visit the Voter Search Page on the State Board of Elections website. Should the federal government require all Americans to have health insurance coverage? Should the federal government increase the minimum wage? Should Congress pass legislation to authorize the South Carolina-based Catawba Indian Nation to purchase land in North Carolina for the purpose of owning and operating an Indian gambling casino along the I-85 corridor west of Charlotte? Should Congress pass legislation like the First Amendment Defense Act (FADA) that would prevent the federal government from discriminating against individuals based on their beliefs about marriage? Should Congress legalize the use of marijuana for medical purposes? Should Internet gambling be prohibited? Should federal nondiscrimination laws include “sexual orientation” and “gender identity” as protected classifications? Should the federal government continue to provide funding for abstinence until marriage sexual education programs? Should organizations that provide abortions be allowed to receive federal funds? Should human embryos be used for research purposes? Should a person’s religious beliefs influence the decisions they make while serving in public office? Should churches and other qualified religious organizations continue to receive tax-exempt status? Should Congress increase taxes in an effort to decrease the national debt? Should Congress pass legislation to further protect students’ rights to free speech and expression on public college campuses? Ike Johnson D No Response was received from the candidate. Dana Outlaw D No Response was received from the candidate. Richard Bew D No Response was received from the candidate. Ernest Reeves D No Response was received from the candidate. Gregory Humphrey D No Response was received from the candidate. Allen Thomas D No Response was received from the candidate. Celeste Cairns R No Response was received from the candidate. Jeff Moore R No Response was received from the candidate. Eric Rouse R No Response was received from the candidate. Tim Harris L No Response was received from the candidate. ANSWER KEY: Y=Yes; N=No; U=Undecided; NR=No Response; *=Additional Comments provided by candidate – click on Candidate’s Name to view scanned questionnaire. PARTY KEY: D=Democratic; R=Republican; CST=Constitution; L=Libertarian. The Special Election to replace North Carolina’s Third District Congressman Walter B. Jones, Jr., who passed away in February, features a slate of 26 candidates. 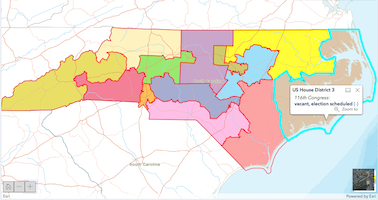 The filing period for this Eastern North Carolina district closed on Friday, March 8. The Primary Election is scheduled for Tuesday, April 30, and early voting runs from Wednesday, April 10 – Friday, April 26. The General Election will be held on Tuesday, July 9, unless the leading candidate in any of the primary races fails to obtain more than 30 percent of the vote. If this happens, a runoff second primary may be held on Tuesday, July 9, and then the General Election will take place on Tuesday, September 10.